This is a country feeling kind of project. 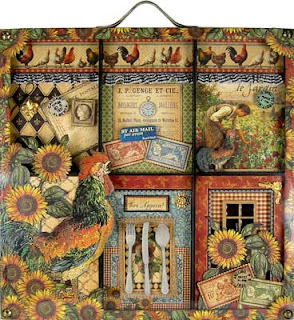 Using Graphic 45's French Country paper collection is heartwarming and inviting. Come join the FUN and create this charming tray! 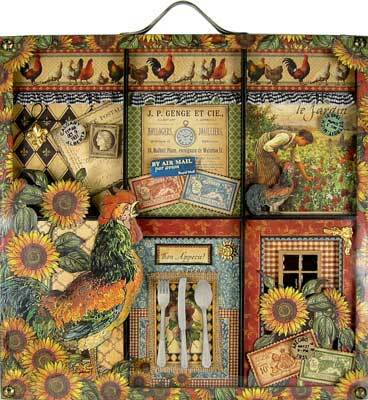 We will be decorating a 7 Gypsies Artist Printer's Tray using Graphic 45 papers from their French Country line. We will embellish with Blossom Buckets resin pieces from the Wendy Vecchi Studio 490 collection for dimension and charm. Please bring to class: a good pair of scissors for "fussy" cutting, paper trimmer, ink for edging edges (black and brown), adhesives (wet and dry), 1/8" x 1/2" foam tape (you will need 36" of foam tape, black would be first choice but white will be fine). Monika will have sheets of acrylic for the front, for $3 each.